July 1st will mark the beginning of the new NBA year and thus the official beginning of the Kevin Durant sweepstakes. 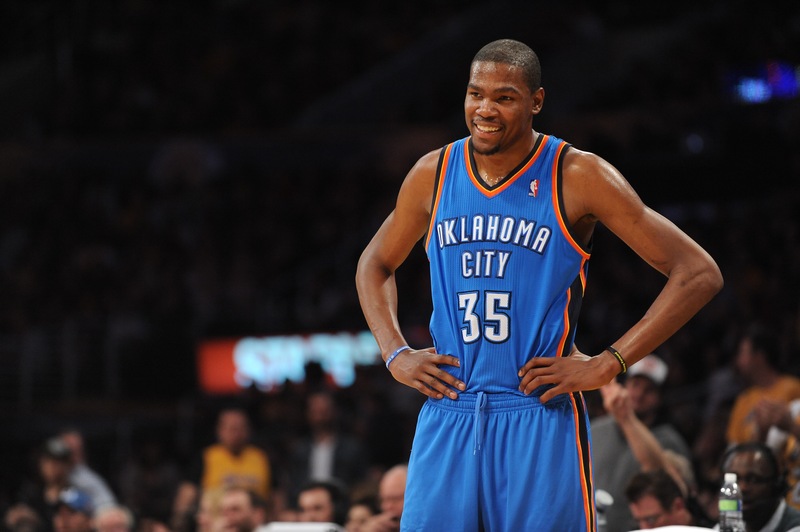 Durant is probably going to sign a one year extension with his Oklahoma City Thunder, but that’s no fun to think about. That’s chalk. It’s way more fun to contemplate where he might go. The Golden State Warriors would be unfair and an unparalleled cop-out for a player previously mad about his perception as second best. The San Antonio Spurs would be incredible, but the previous big three of Duncan/Parker/Manu is near retirement. The Miami Heat would be a straight coup from Pat Riley, and it’s genuinely fun to entertain this idea. The Los Angeles Clippers are fun but a downgrade from his current supporting cast in the fight against GSW, and leaves a huge Blake Griffin problem to address. The New York Knicks aren’t happening, sorry Chase. But the Boston Celtics? The team full of really talented pieces that are Durant away from destroying the East, contending with Cleveland, and own Brooklyn’s (likely top 3) pick next year? That’s intriguing, and might give him a straight shot to the Finals, or at least less of the death match that the West presents. Biased? Of course, but facts don’t lie. Coming to Boston was the best decision of my life, Kev. Trust me here.